Saturday May 30th is the date for the Annual Ceremonial Review. 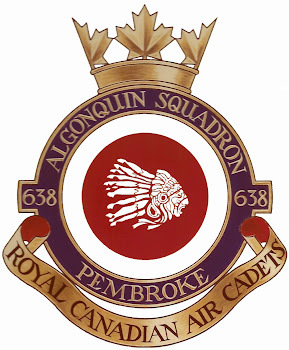 Cadets are to be at 450 Tactical Helicopter Squadron at Garrison Petawawa for 0800 hrs. The Review start at 1300 hrs but we ask that guests be seated by 1230 hrs. Cadets are to come in civilian clothing but must bring their complete uniform to change into prior to the parade. Lunch will be provided for the cadets. Please be advised that all people driving onto the Garrison will need to provide ID at the main gate upon entry. A drivers license will suffice. Although you will be able to use cell phones for that day at the squadron, please be advised that that is only for use as a camera. Your other services will probably not work while in the secured area. Take Petawawa Boulevard to the main entrance to Garrison Petawawa. Once you drive on to the Garrison, Petawawa Boulevard turns into Menin Road. Continue on Menin Road and turn right on Passchendale Road. Continue on Passchendale Road for approximately 3.5 km and turn left on Brindle Road. Take the first right after you have turned on Brindle Road. This will lead you to Building CC-128. The main entrance is on the left side of the building as you arrive. You can't miss the flags. You can park anywhere on the main parking lot. These directions can also be found at the bottom of the letter that went home with cadets on Wednesday.